Facebook has debuted Oculus Go, its standalone $199 VR headset that the company hopes will launch more widespread engagement with virtual reality. Unlike the Oculus Rift, Oculus Go does not require a high-end smartphone or computer, has no wires or cables, and is ready to use out of the box. Early reviews give the VR headset a thumbs-up for its simplicity and convenience, and such features as speakers built into the strap. Also at its F8 developer conference, Facebook debuted a new version of Oculus Rooms. In May, Facebook plans to launch Oculus TV with Netflix, Hulu and Showtime to enable TV viewing in VR. “The goal is to get immersive live content that you can kind of build a virtual crowd of people who share interests and go and watch,” said Oculus product manager Madhu Muthukumar. Engadget also reviewed Oculus Go, dubbing it “the most convenient and comfortable VR headset ever made.” “The Oculus Go is the virtual reality headset we’ve been waiting for,” it added. “Not because it’s incredibly powerful, but because it’s inexpensive and easy to use” — and lightweight, at just over a pound. Oculus Santa Cruz will offer six degrees of freedom “in a wireless and self-contained headset,” but the company hasn’t set a delivery date for that device. 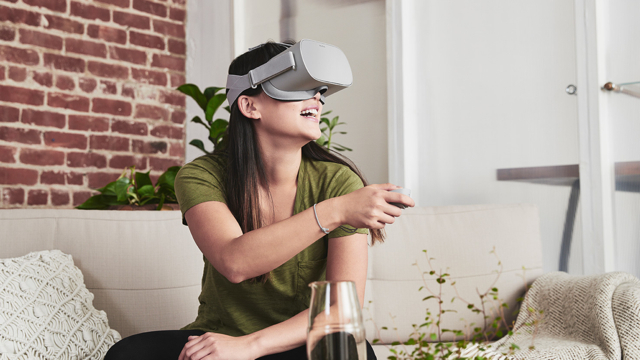 Wearing the Oculus Go, the reviewer watched an hour of Netflix TV and played games, finding it “a fun way to stay connected.” Playing games, he was surprised “that it recognized fine movements for different types of swings,” calling the experience “a solid example of what’s possible with the Go, even if it’s limited to mobile hardware.” According to Oculus, the battery will get 2.5 hours of life while watching video and a bit over two hours while playing games.